I am writing on behalf of Clean Air in London (CAL) to lodge formally with the European Commission (Commission) a two-part complaint against the United Kingdom (UK) for measures or practices incompatible with one or more provisions or principles of European Union (EU) law (the Complaint). ‘Part one’ of the Complaint is that: the UK obtained unlawfully a time extension to comply with the daily limit value for dangerous airborne particles (PM10) in London; and, without prejudice to that part of the Complaint, even if a time extension is sustained for the PM10 daily limit value, it was breached in Neasden Lane (again) in 2011. ‘Part two’ of the Complaint is that: the UK breached the annual mean and hourly limit values for nitrogen dioxide (NO2) in London and 16 other zones in 2010 (and 2011); and has not applied for a time extension for those zones (i.e. Article 22 plans were submitted for 23 zones and Article 23 plans were submitted for London and 16 other zones). CAL urges the Commission to launch infraction against the UK by no later than 30 April 2012 to enforce the PM10 daily limit value and the NO2 annual mean and hourly limit values. CAL would welcome a meeting with Commissioner Potočnik and/or his senior team or the Secretariat-General to discuss this Complaint. ‘Part one’ of the Complaint relates to dangerous airborne particles (PM10). The Commission’s media release stated that “the Commission considers there may still be a risk of the [PM10] daily limit value being exceeded after the exemption period. The request is therefore granted on the condition that short-term measures are introduced to control, or, where necessary, suspend activities which contribute to the risk of the limit values being exceeded”. CAL understands that in July 2011 the Commission granted the UK a time extension until 11 June 2011 to comply with the PM10 daily limit value in London. As you may know, ClientEarth launched legal proceedings against the Secretary of State for Environment Food and Rural Affairs citing inter alia the UK’s failure to consult on its ‘Update to the Air Quality Plan’. 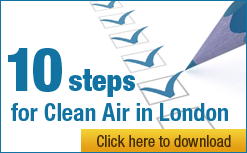 As a result, Defra launched a public consultation on the ‘Update to the Air Quality Plan for London’ on 12 October 2011 which closed on 6 January 2012. The UK cannot retrospectively comply lawfully with the deadline of 30 November 2011. Please see attached CAL’s response to that consultation which shows inter alia that the UK failed to control exceedances of the PM10 daily limit value in London after 11 June 2011. Exhibit 1. On 16 December 2011, the UK submitted ‘Air Pollution in the UK 2010 – Compliance Assessment Summary’ to the Commission. That report confirmed the UK had breached the PM10 daily limit value in London in 2010. Complaint: ‘Part one’ of CAL’s Complaint is that the UK failed to submit lawfully an amended air quality plan for London to the Commission by 30 November 2011 and therefore failed to comply with the Commission’s condition for a time extension to comply with the PM10 daily limit value in London. The UK has therefore not obtained a time extension to comply with the PM10 daily limit value in London and remains in breach of that legal requirement every year since 2005. Remedy: The Commission is requested immediately to revoke the UK’s time extension to comply with the PM10 daily limit value in London and refer the UK to the Court of Justice of the European Union for breaching the PM10 daily limit value in London in 2010. Please make an announcement to this effect by 30 April 2012. The Neasden Lane monitoring station is not part of Defra’s official monitoring network and so has not been reported previously to the Commission and might not be reported in future. However, Defra has confirmed in writing to CAL that such a site is relevant if it changes the status of the London zone (which it would do as Defra’s official monitoring site at Marylebone Road in London shows compliance in 2011). CAL has been assured the Neasden Lane monitoring station satisfies the quality control and micro-siting requirements of Directive 2008/50/EC. Mayor announced on Friday 23 December 2011 that he plans to use dust suppressants more widely in 2012 including in Neasden Lane. CAL condemns unreservedly the Mayor’s use of dust suppressants in front of monitoring stations or in any other way that might affect the reporting of monitored air quality. In January 2011, CAL alerted the Commission to Defra’s failure to report the highest monitored exceedances for PM10 in London to the Commission e.g. Horn Lane, Neasden Lane and Upper Thames Street. In response to a request for environmental information, Defra wrote to CAL in a letter dated 11 May 2011 refusing to release information relating to its five year review of the air quality monitoring network. In doing so, Defra stated inter alia, that to do so would ‘risk drawing resources away from the review itself and potentially delaying a process that the Secretary of State has a statutory duty under the AQSR 2010 to complete every five years’. That letter is attached (Exhibit 2). Further correspondence is available if you wish to see it. CAL considers that Defra should acknowledge data from monitoring stations in Marylebone Road and a portfolio of other sites likely to breach the EU limit values and report transparently the facts to the Commission particularly where, as in 2011 at Neasden Lane, one of those sites changes the status of the London zone. In any event, once ratified, there will be no question the PM10 daily limit value was breached in Neasden Lane in London in 2011. ‘Part two’ of the Complaint relates to nitrogen dioxide (NO2). The UK submitted ‘Updated Air Quality Plans and Programmes to meet European Union (EU) limit values for nitrogen dioxide (NO2) in the UK’ to the Commission on 22 September 2011. “Air quality limit values for NO2 are already met across 99% of the UK land area and 97% of the population and further improvements are expected in coming years. However, parts of 40 of the 43 UK zones have not achieved full compliance with the annual NO2 limit value in 2010. Parts of three of the 40 zones are also non-compliant with the hourly limit value in 2010. The UK is therefore submitting to the European Commission air quality plans with a view to postponement of the compliance date to 2015 where attainment by this date is projected.” CAL emphasis. “Table 1 summarises compliance in the baseline reference year of 2008, the projections to 2010 and the estimated compliance date for each zone. The table shows that of the 40 zones with exceedances in 2010, compliance may be achieved by 2015 in 23 zones, 16 zones are expected to achieve compliance between 2015 and 2020 and that compliance in the London zone is currently expected to be achieved before 2025.” CAL emphasis. On 16 December 2011, the UK submitted ‘Air Pollution in the UK 2010 – Compliance Assessment Summary’ to the Commission. That report confirmed the UK had breached the NO2 limit value in London and 39 of 42 other zones in 2010. Please see also CAL’s response dated 4 August 2011 to Defra’s consultation on NO2 Plans and Programmes. Exhibit 3. Complaint: ‘Part two’ of the Complaint is that the UK breached the NO2 annual mean and hourly limit values in 2010 in London and 16 other zones. The UK has failed to submit a valid time extension application to comply with the NO2 limit values in London (and at least 16 other zones around the UK). For the avoidance of doubt, the UK has applied under Article 22 for a time extension to comply with the NO2 limit values in up to 23 zones only and has submitted Plans and Programmes for London and 16 other zones under Article 23 to comply with the NO2 limit values in the ‘shortest time possible’. The UK Government confirmed that position in the UK’s High Court on 13 December 2011 when defending itself against ClientEarth’s request for judicial review. In the same Court Hearing, the UK Government confirmed to the Judge that the UK had breached the NO2 limit values in 2010. CAL would be pleased to send you the transcript from the Court hearing as soon as it is available. Please do not allow the UK to obscure those facts as it seems to be doing with ambiguous wording. Remedy: The Commission is therefore requested to commence by 30 April 2012 infraction action against the UK for failing to comply with the NO2 limit values in London and 16 other zones in 2010. CAL asked Defra whether it had undertaken an equalities assessment in relation to the Plans and Programmes submitted to the Commission for NO2. Defra confirmed to CAL’s solicitors in a letter dated 22 December 2011 (Exhibit 4) that ‘we do not consider that we are making any policy decisions that impinge on these duties’ i.e. not one single new measure is included in the Plans and Programmes. Measures included date back to 2006; some may sound ambitious but have never been implemented. CAL wrote to Commissioner Potočnik responding to the Commission’s consultation on the ‘Year of Air’ planned for 2013 (Exhibit 5) in a letter dated 30 September 2011. In that letter, CAL emphasised the need to enforce existing air quality laws and for any new proposals to ensure continuity and the further tightening of health and legal protections. Please therefore commence infraction action against the UK by 30 April 2012. You will be aware that the UK is due to host the London 2012 Olympic and Paralympic Games. Air quality was a serious concern before the Beijing 2008 Olympic and Paralympic Games despite Beijing not breaching, as far as CAL is aware, any air quality laws. Exhibit 6 shows concentrations of NO2 in London and Beijing and the success the People’s Republic of China achieved in reducing them for those Games. The LAQN shows annual mean NO2 of 97 micrograms per metre cubed (µg/m3) in 2011 and 205 exceedances of the NO2 hourly limit value compared to the legal limit of 40 µg/m3 and 18 hours over 200 µg/m3 respectively. The World Health Organisation guideline is an annual mean of 40 µg/m3 and an hourly mean of 200 µg/m3. Exhibit 6 shows comparable concentrations of NO2 in London and Beijing. As set out above, NO2 limit values are exceeded by a factor of two or more near London’s busiest streets. At the moment, in sharp contrast to the efforts of the People’s Republic of China before the Beijing 2008 Olympic and Paralympic Games, there is no evidence Europe is seeking to enforce or comply with air quality standards during the Olympics. On the contrary, please see Exhibit 7. Please launch infraction action against the UK by 30 April 2012 to enforce the PM10 and NO2 limit values and ensure that London, the UK and Europe lead the world in their efforts to protect public health and comply fully with air pollution laws.